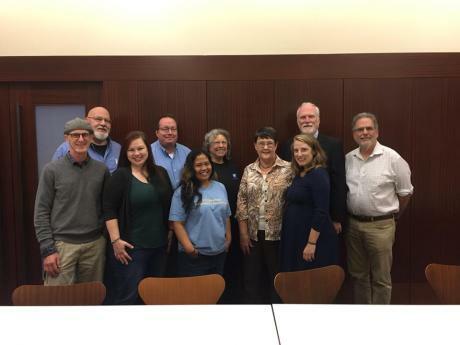 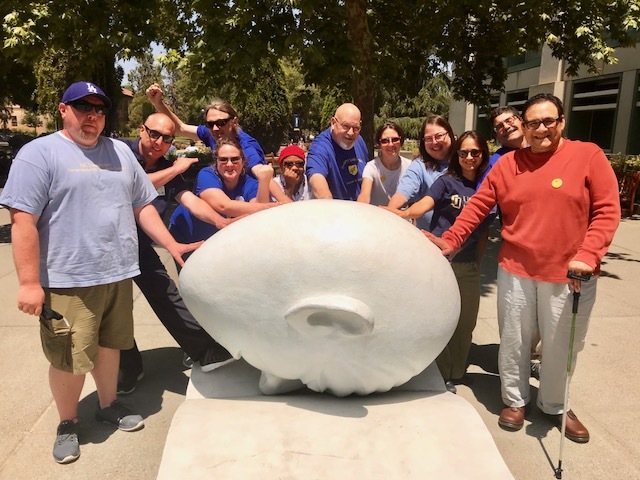 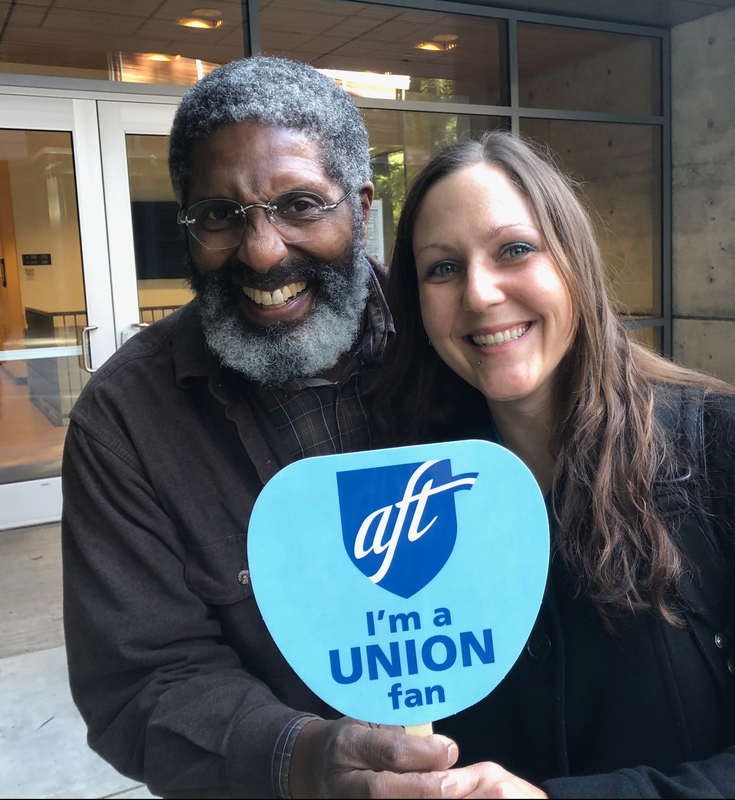 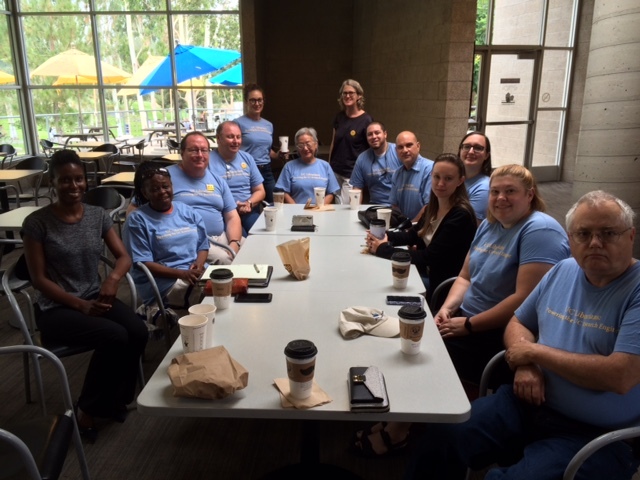 Our bargaining team met at the rainy UC Davis campus on Tuesday, January 15 for our twelfth bargaining session. 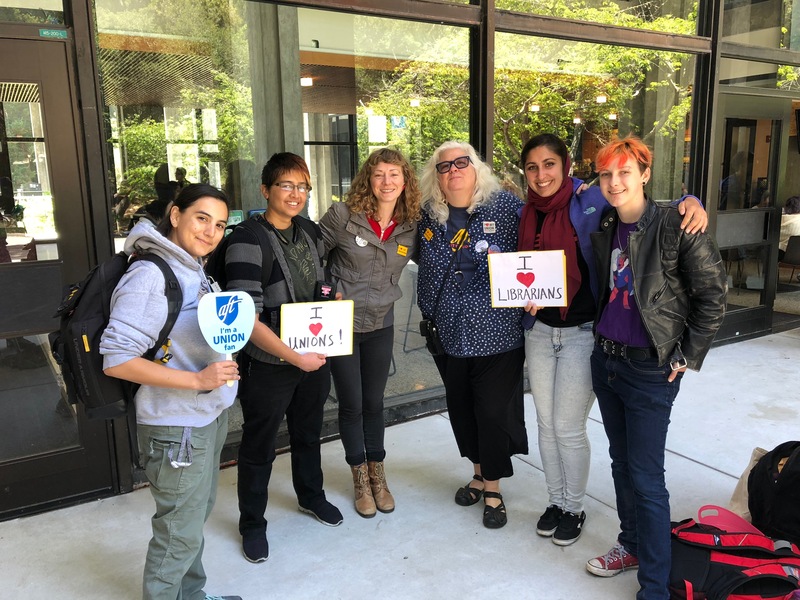 We met in the beautiful Gladys Valley Hall, home of the School of Veterinary Medicine instruction program, with an amazing Dale Chihuly sculpture in its atrium. 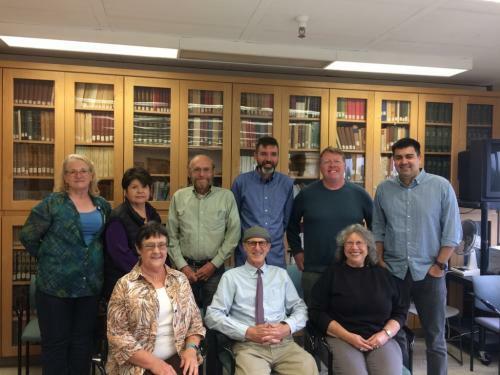 The team decided before this session that we would not present anything to the UCOP team: we have given them proposals for all the articles we opened during the sun-shining process, but have not received much in the way of counter-proposals, apart from an indication that UCOP wanted to maintain “Current Contract Language” (CCL). 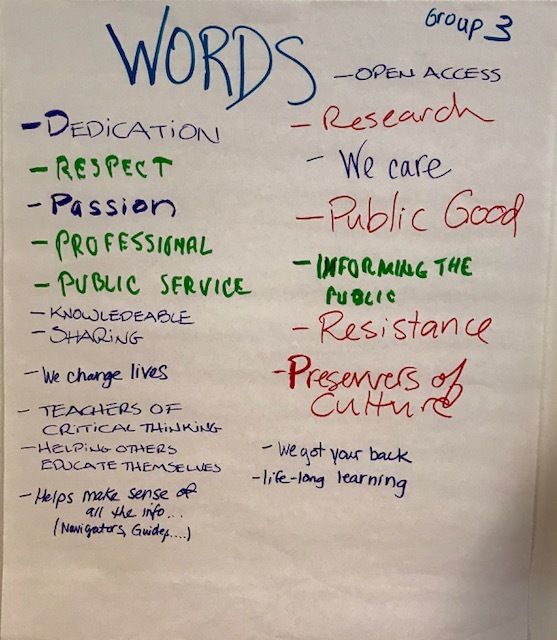 The morning began with a more substantive response from UCOP on salary, leading to productive but informal discussion on their conceptual model. 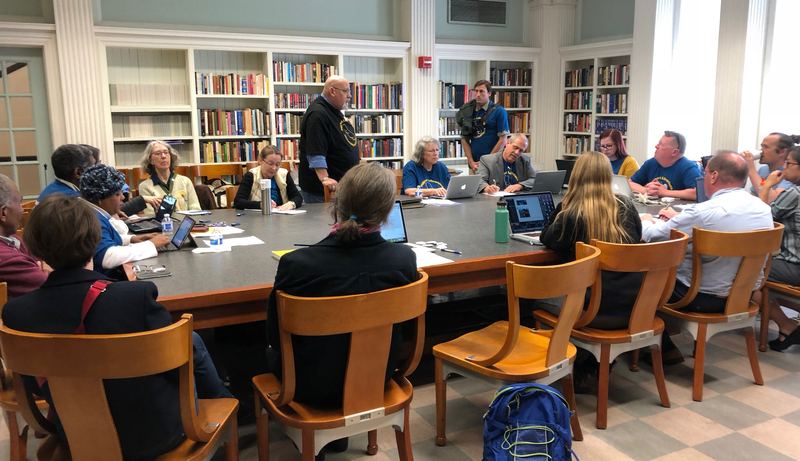 The topic was left with a request for more clarity and specifics on their conceptual model; this will certainly be continued at our next session. 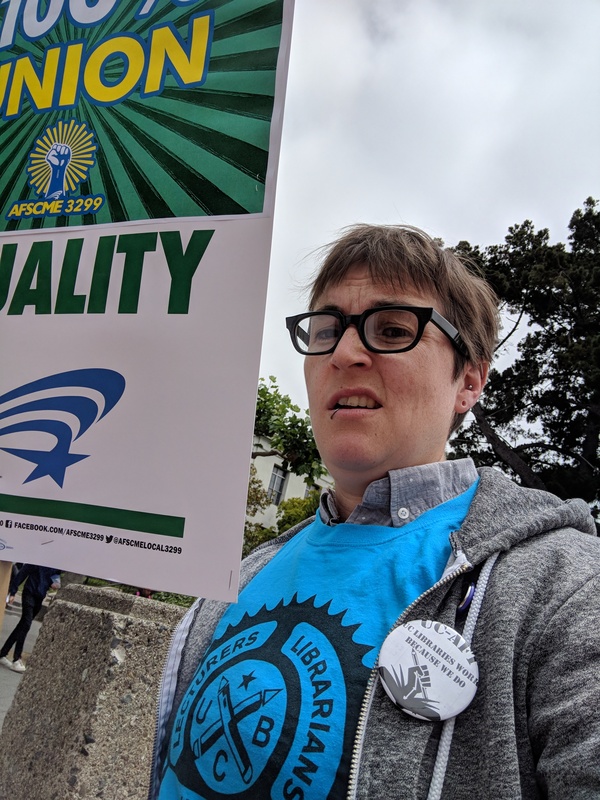 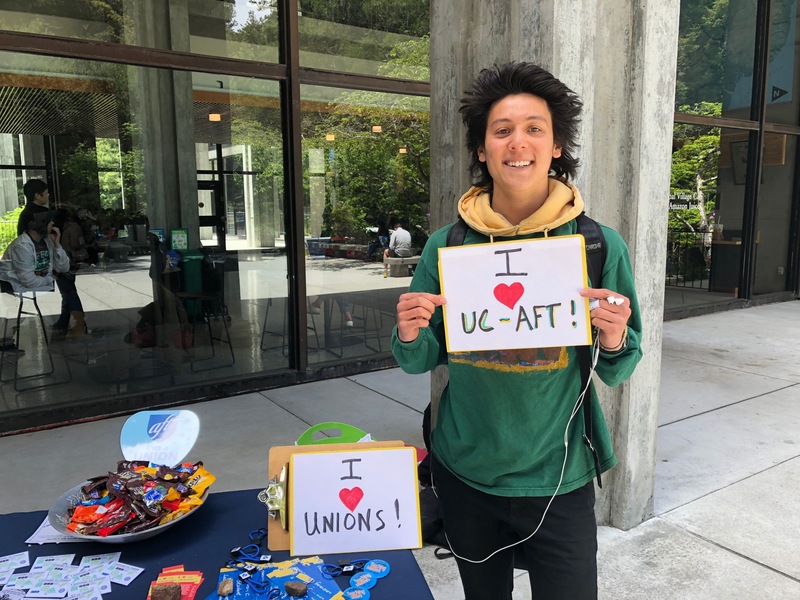 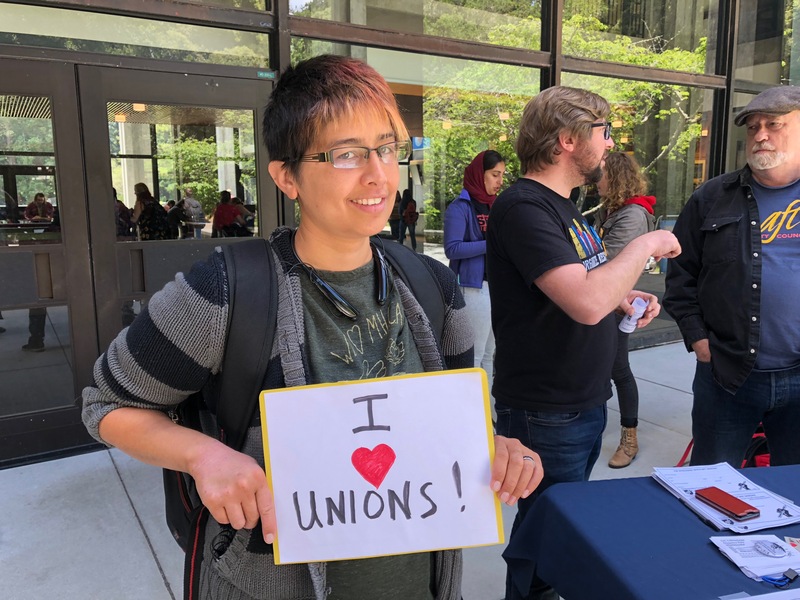 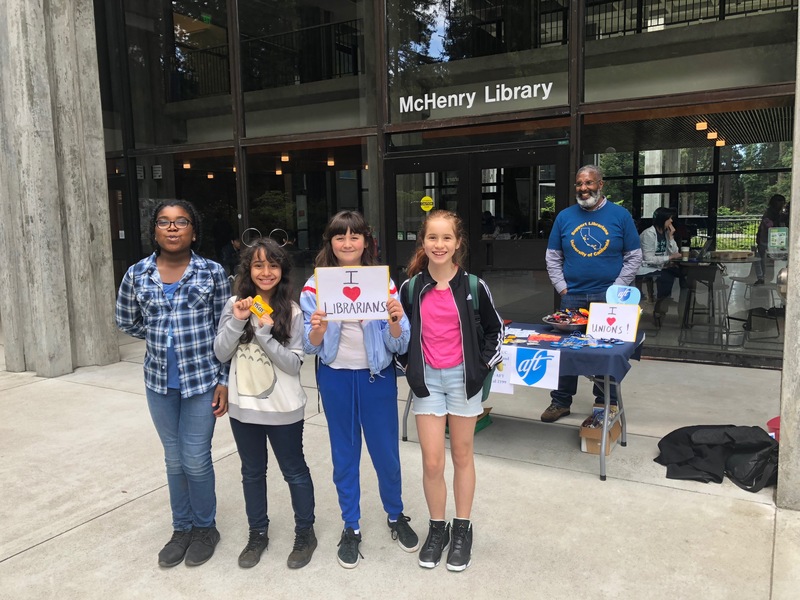 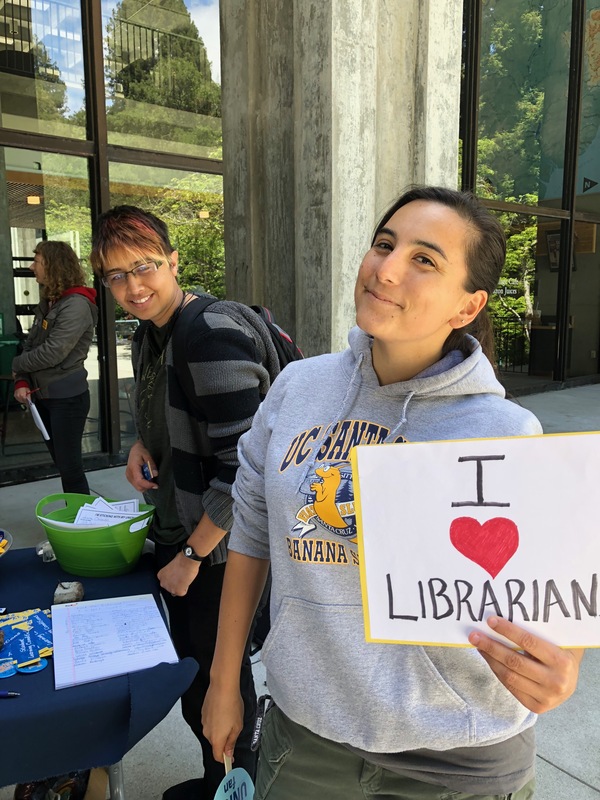 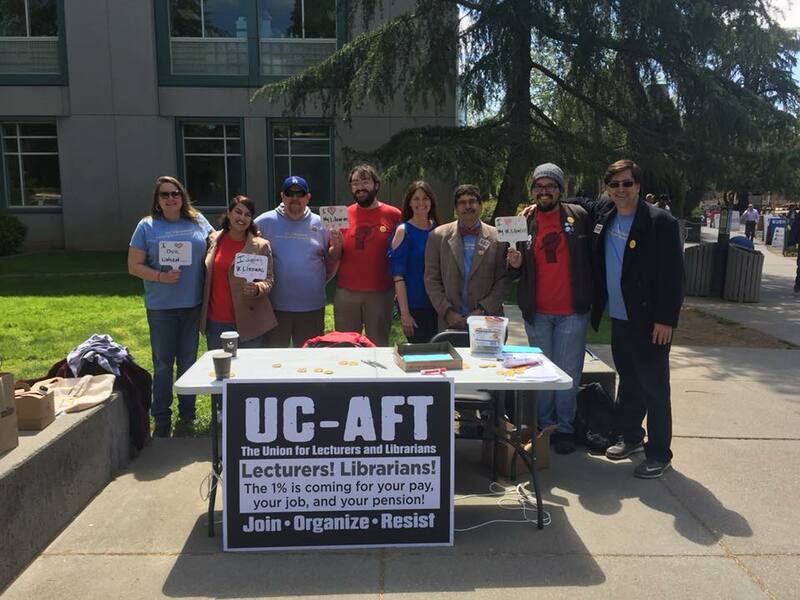 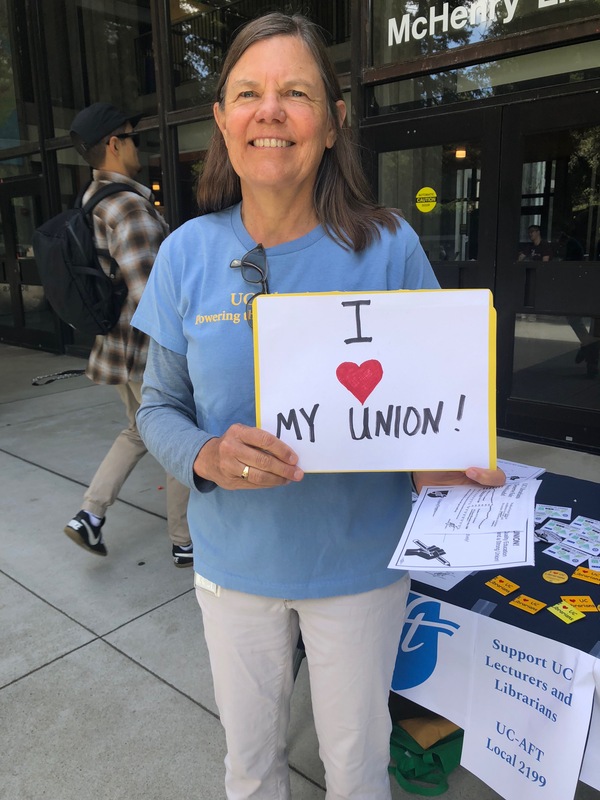 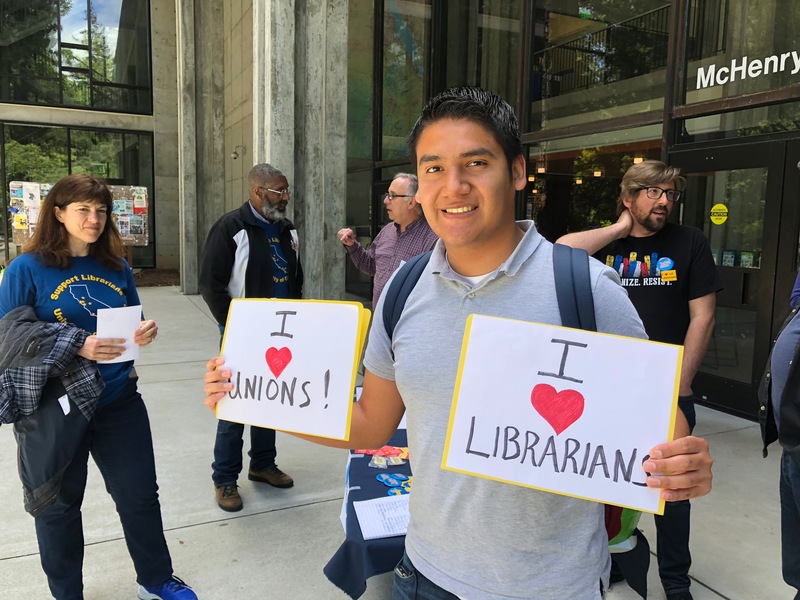 At lunchtime, the table team and supporters from several unions braved the cold and rainy weather for a small rally in front of UC Davis’ Shields Library. 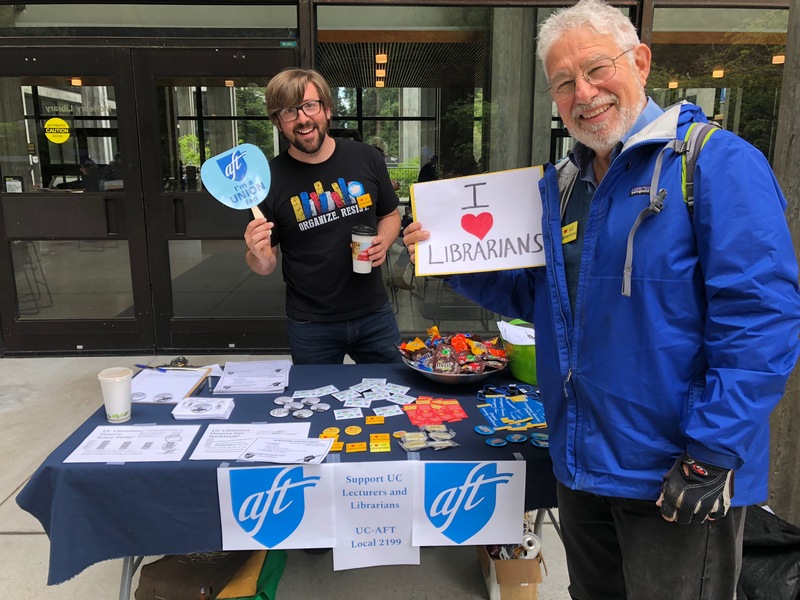 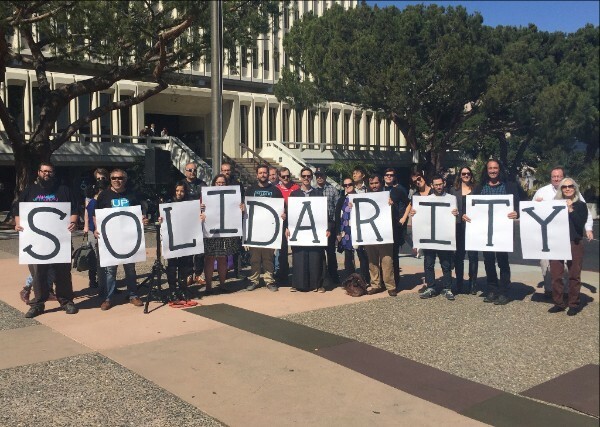 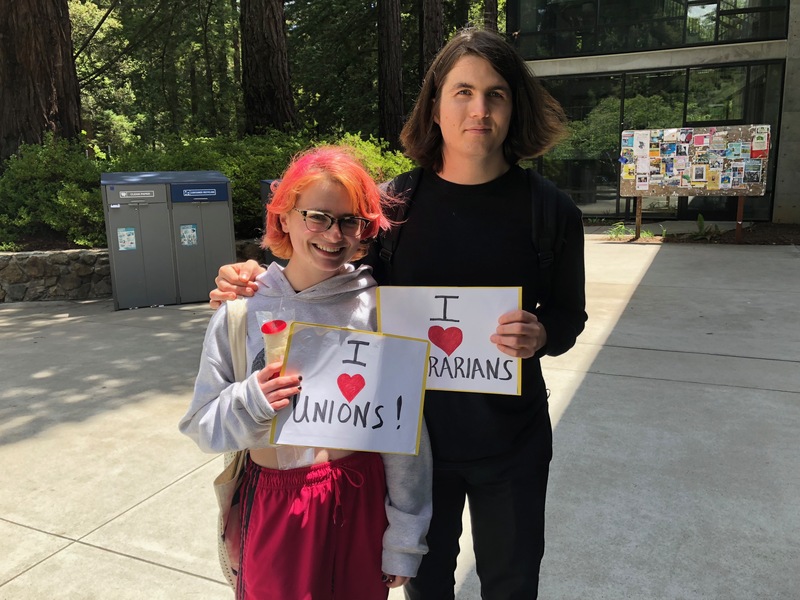 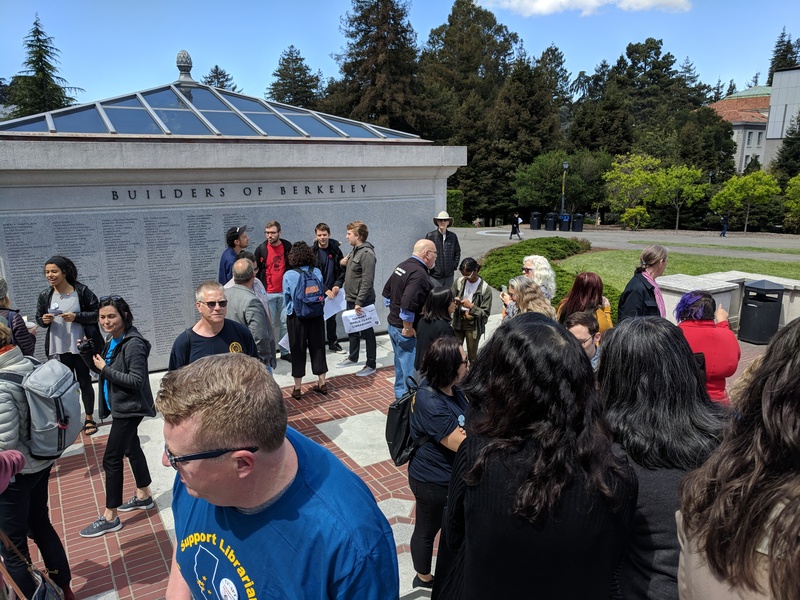 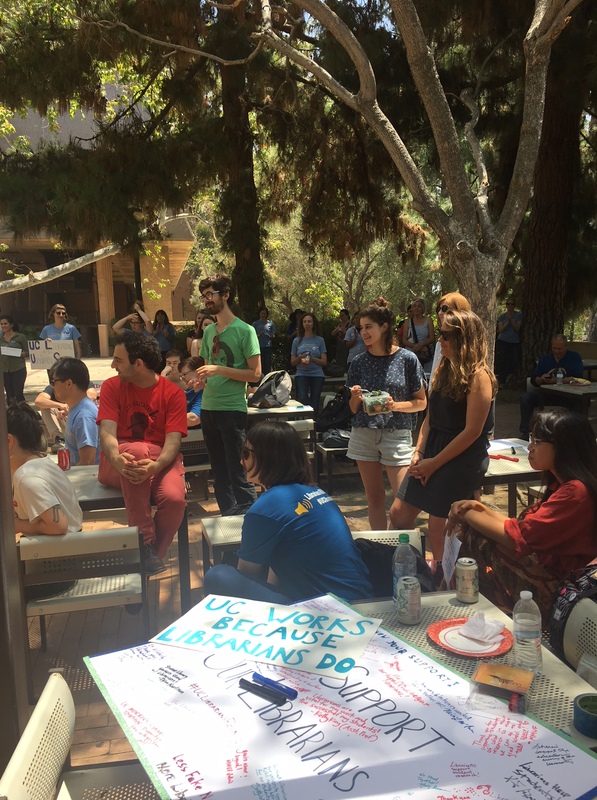 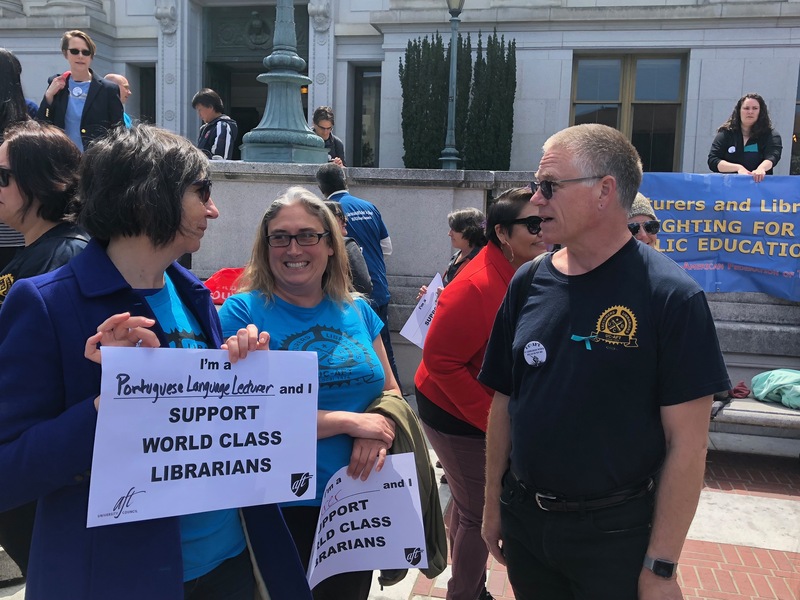 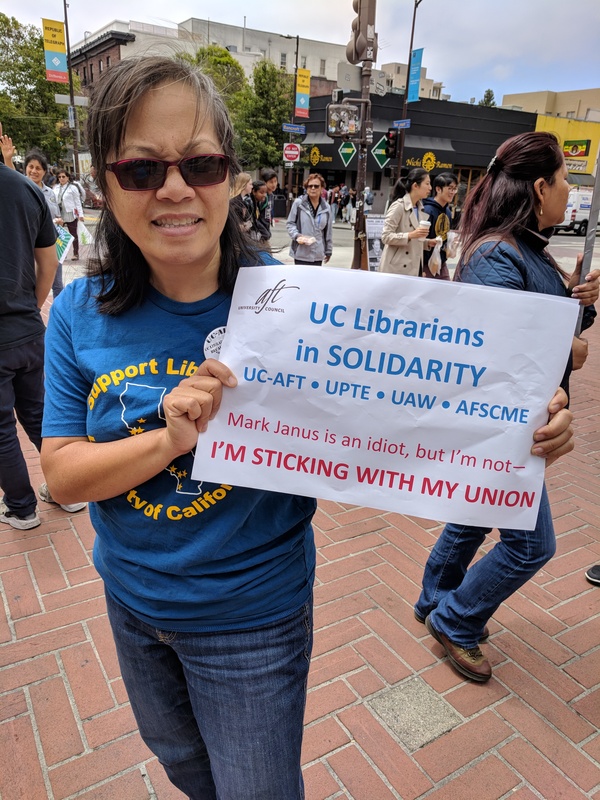 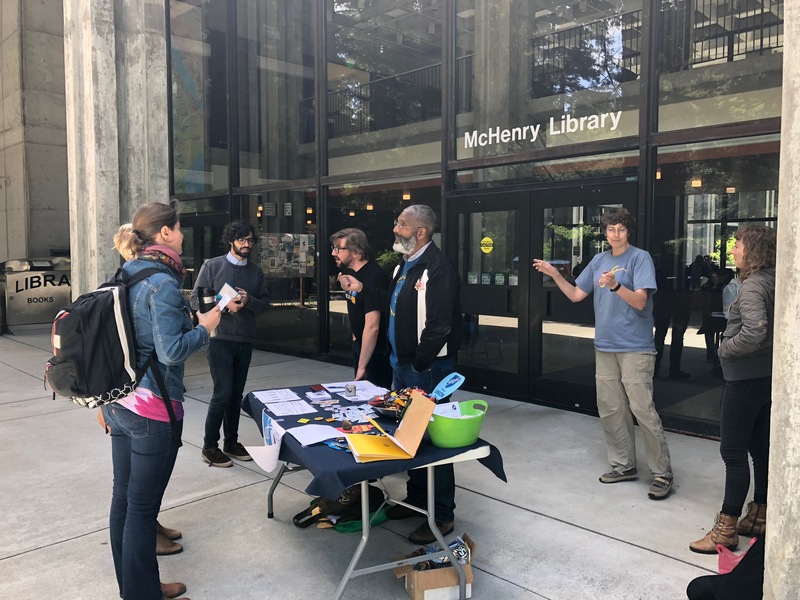 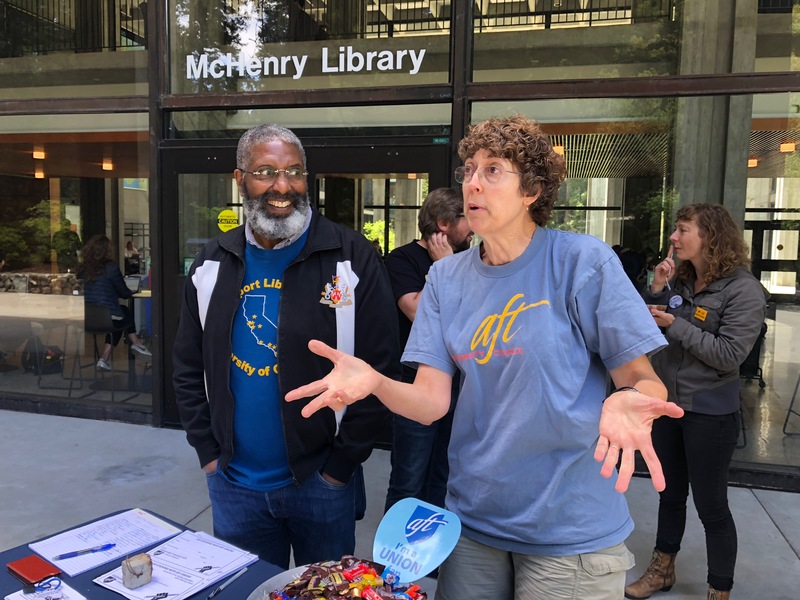 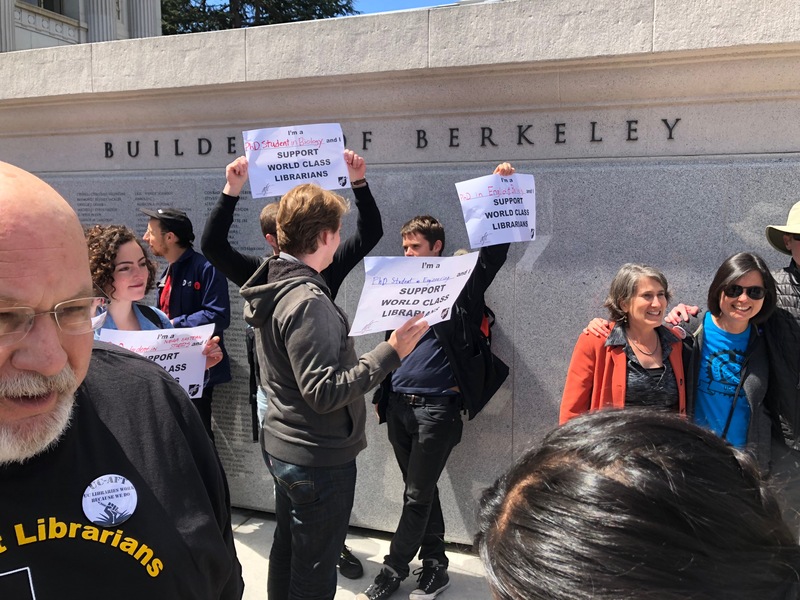 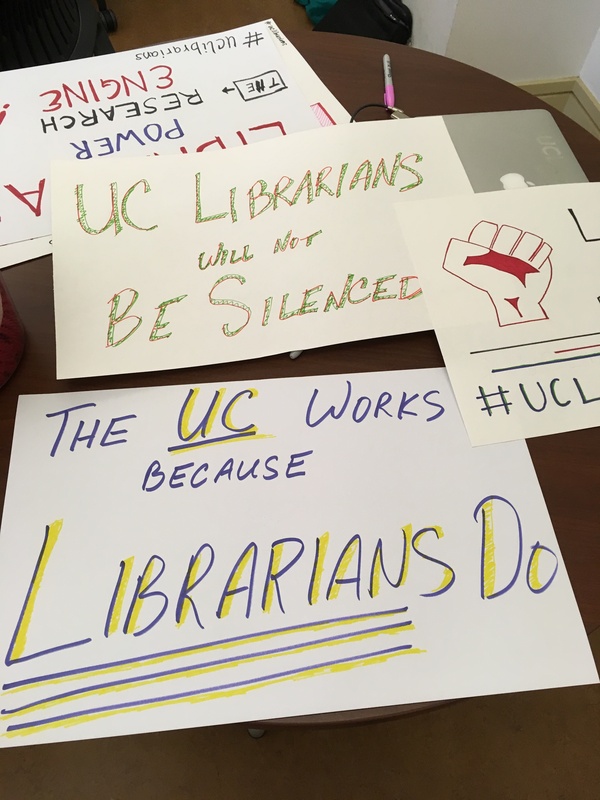 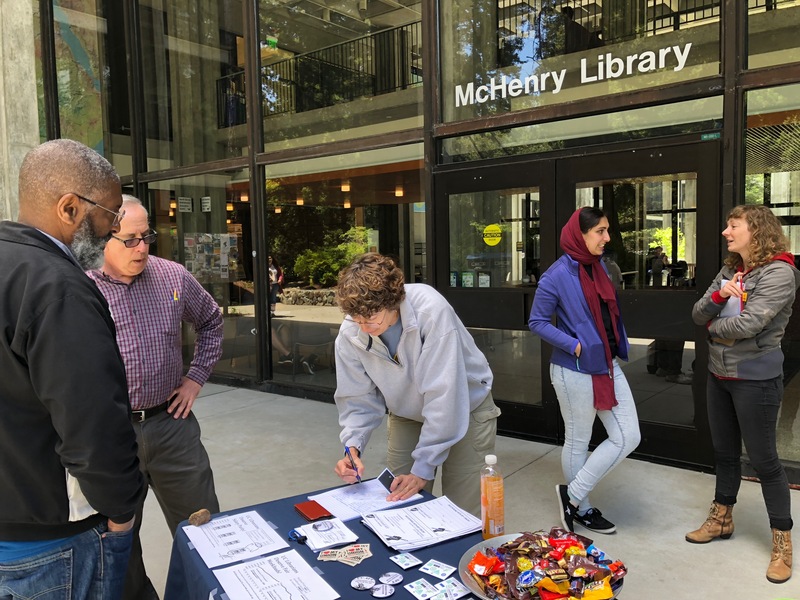 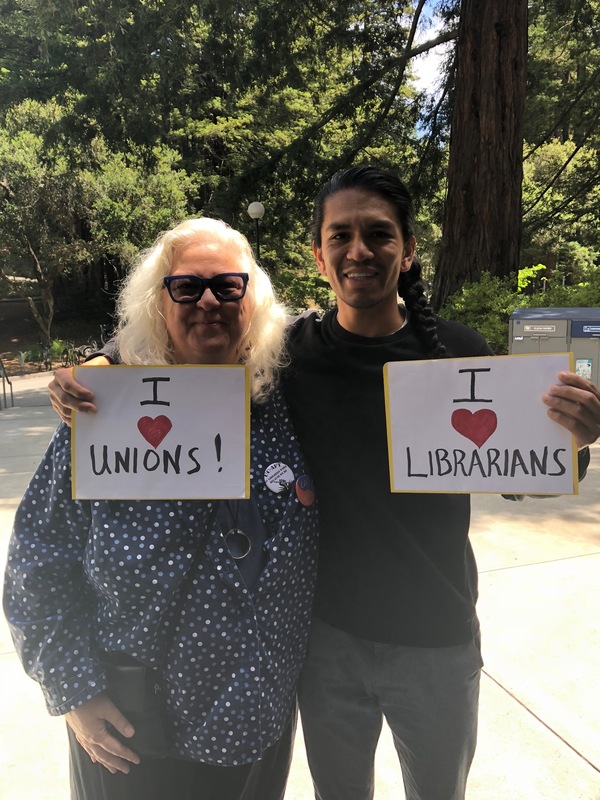 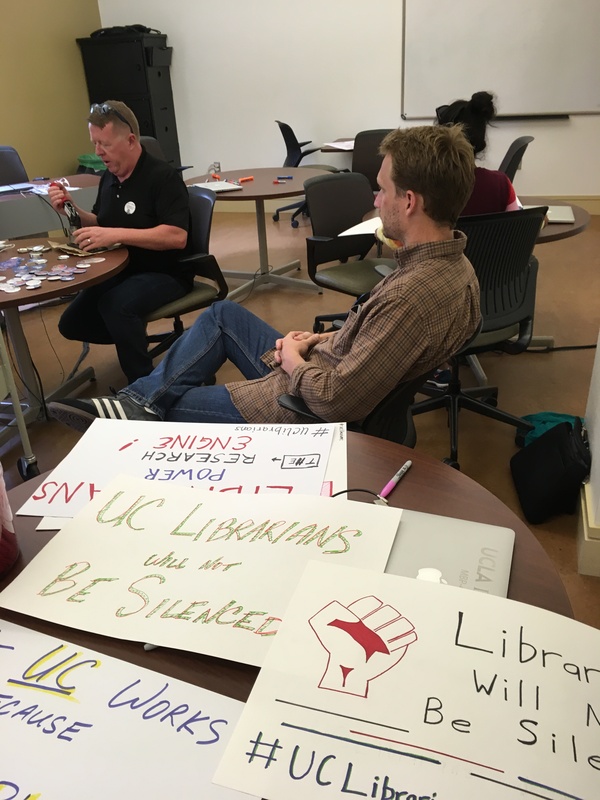 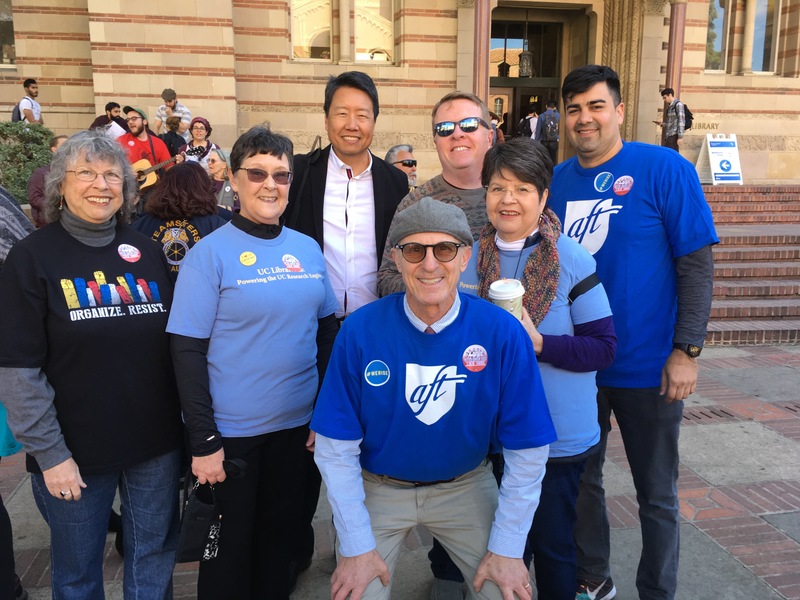 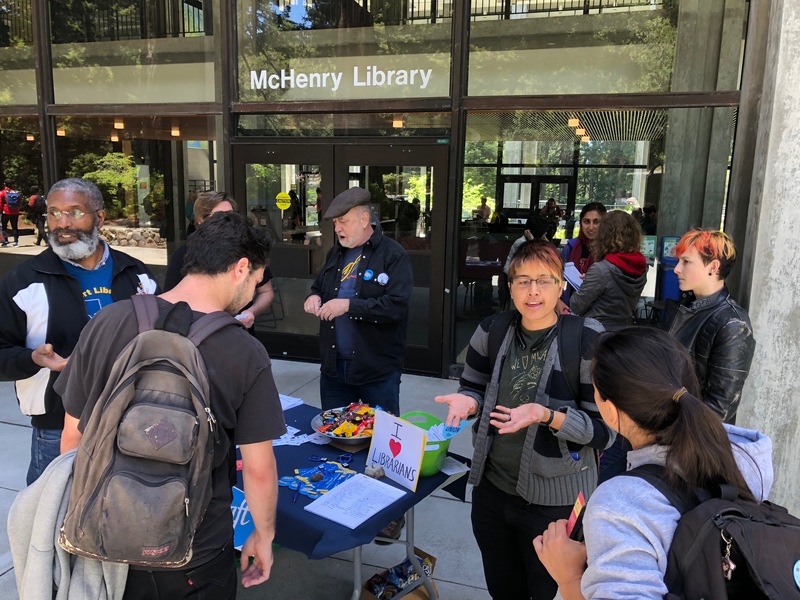 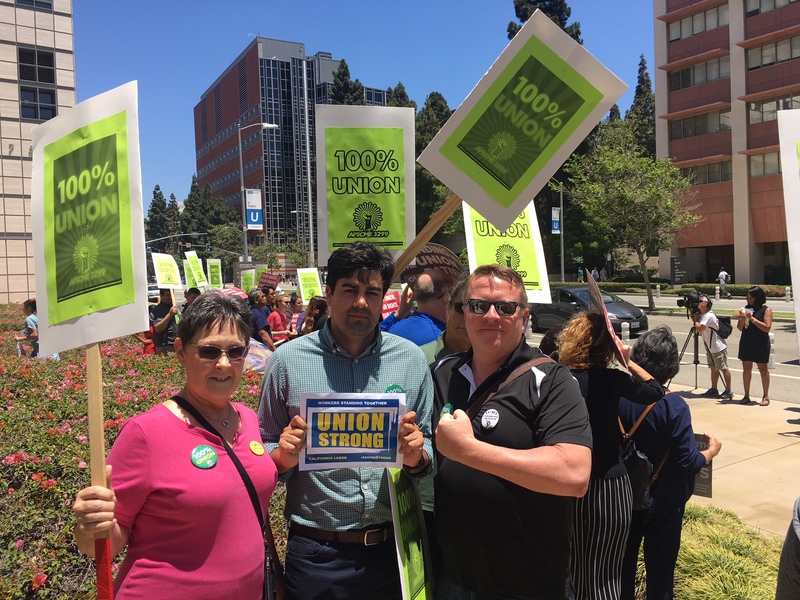 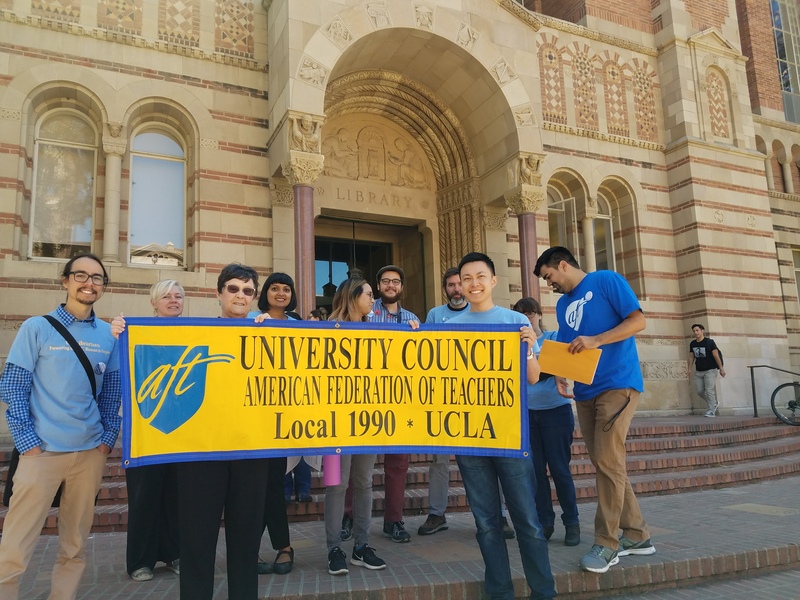 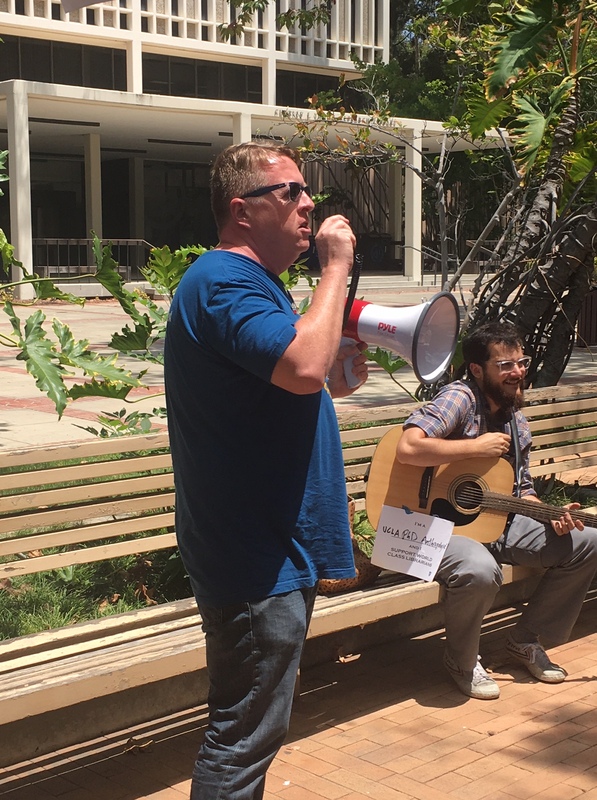 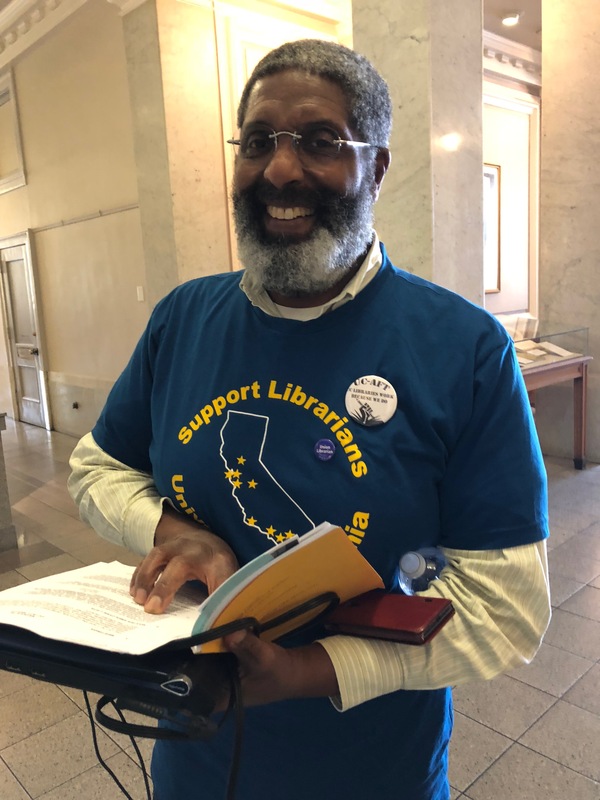 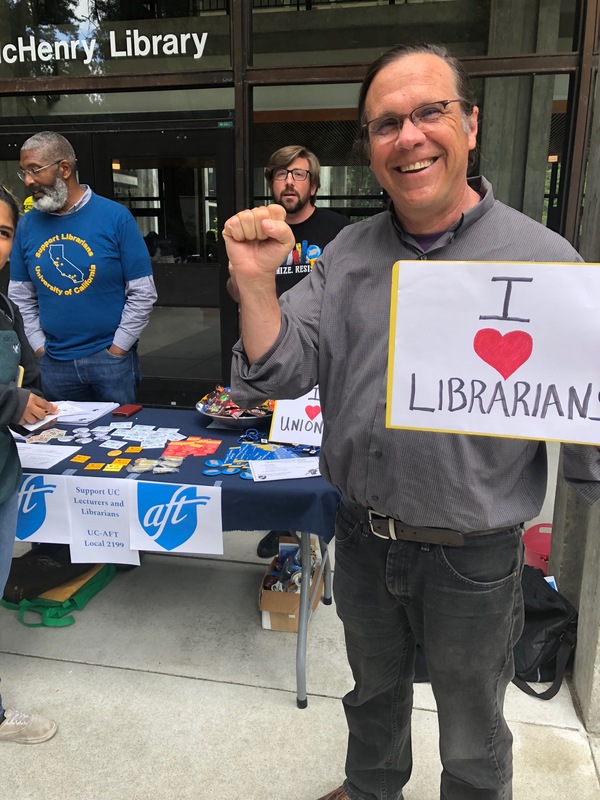 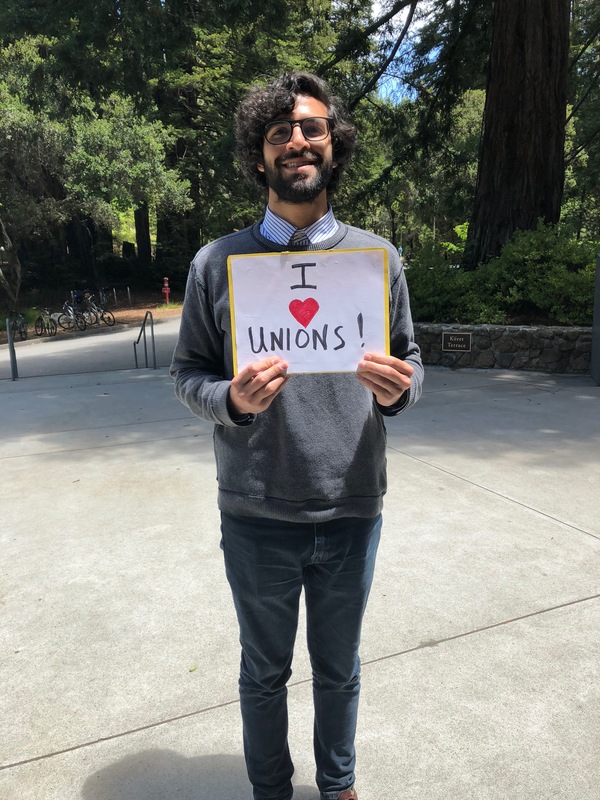 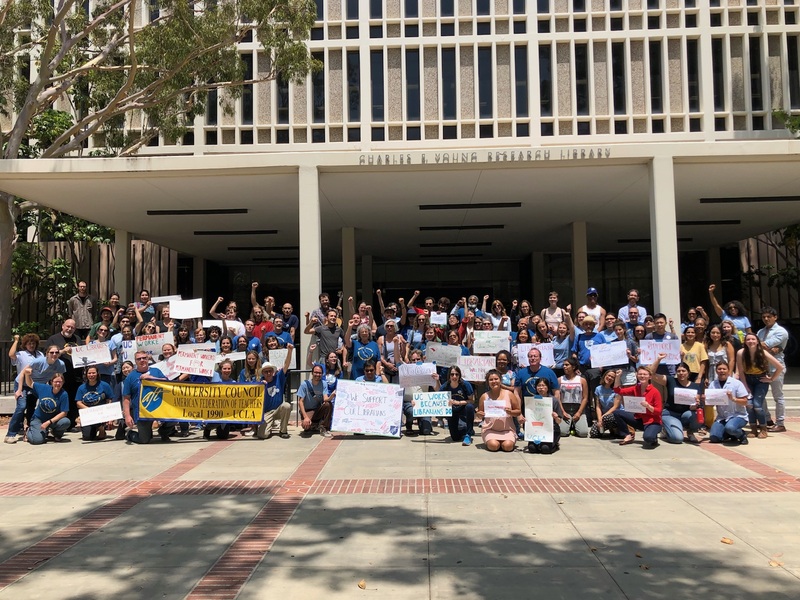 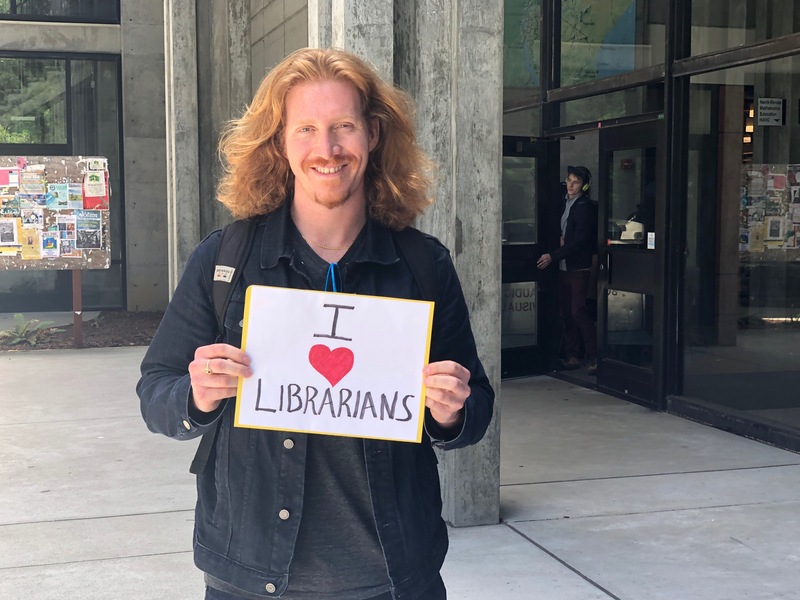 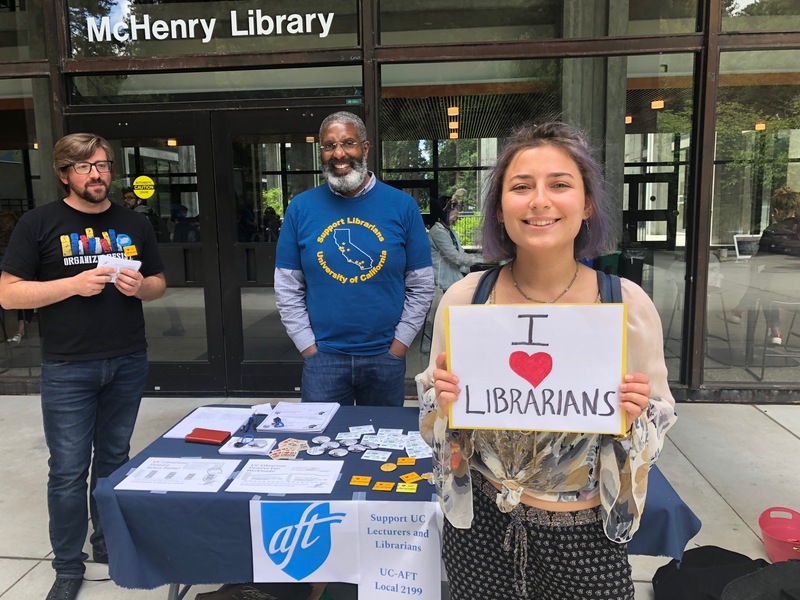 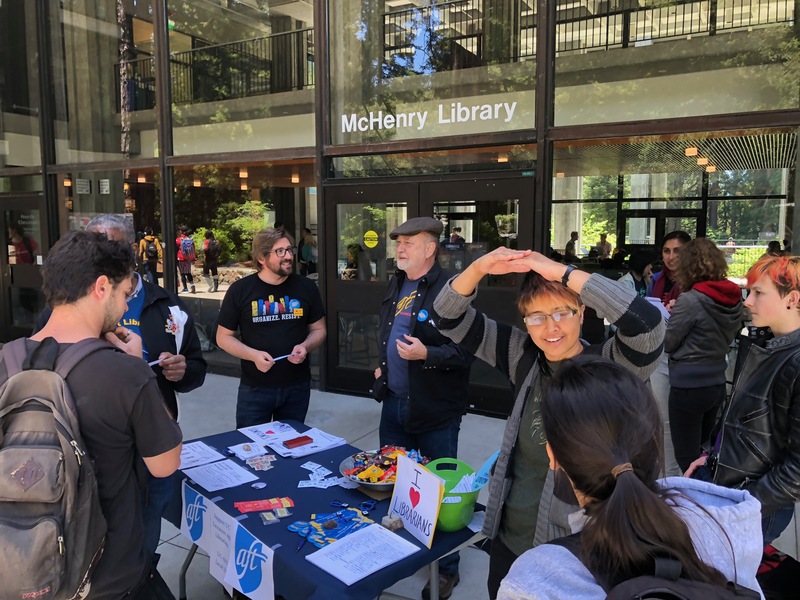 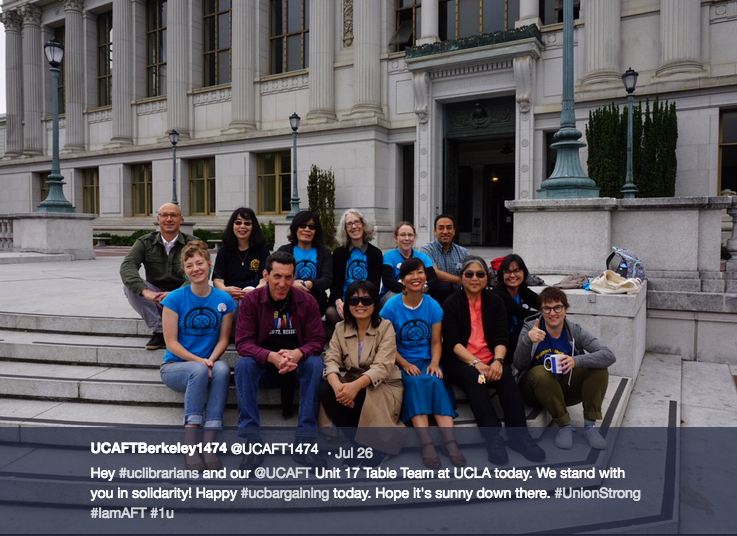 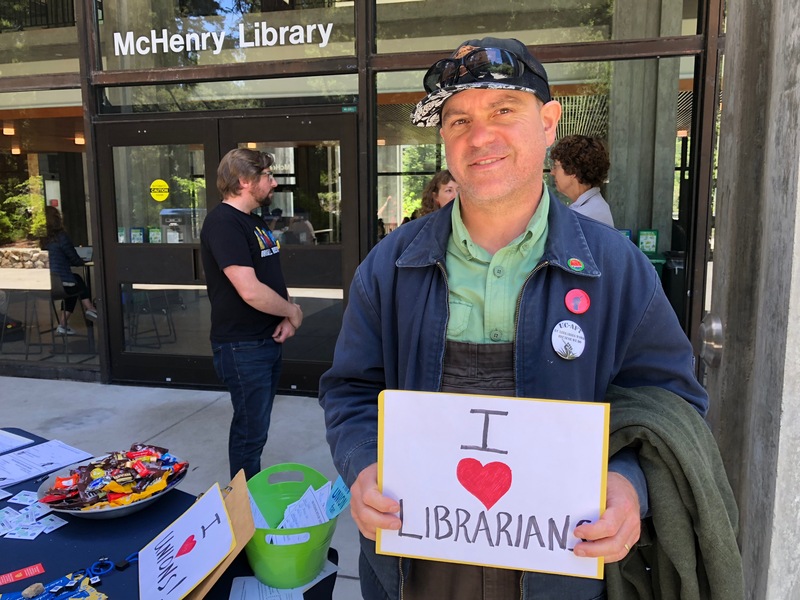 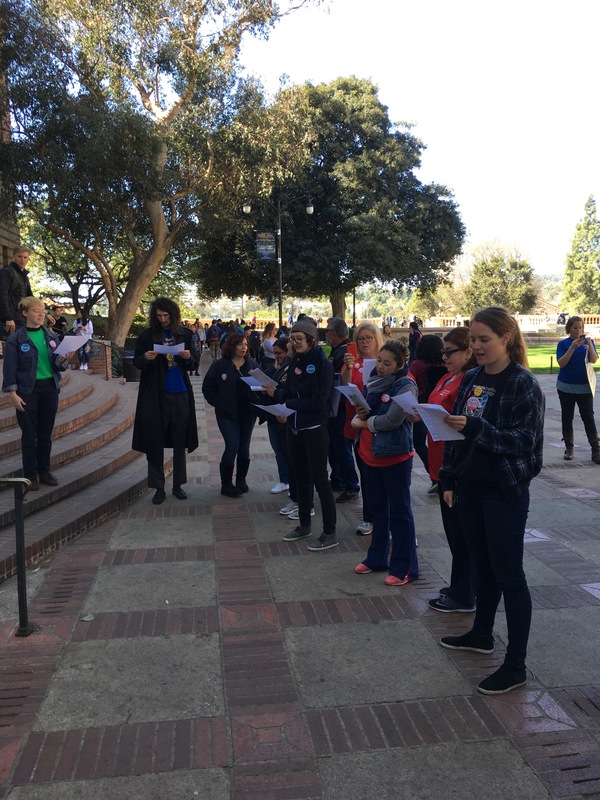 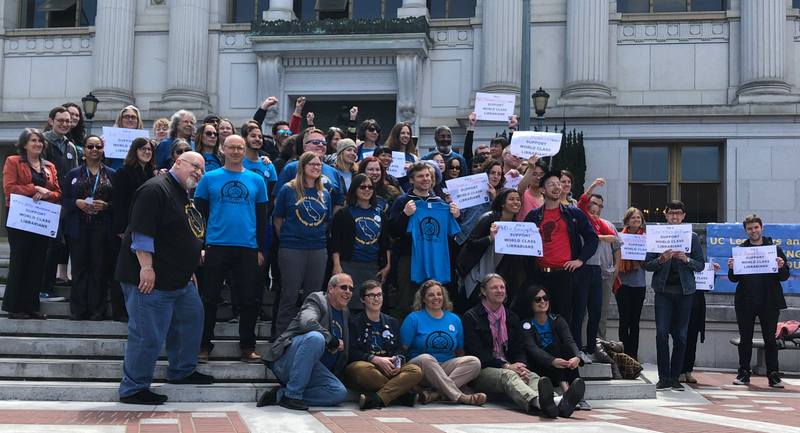 Davis librarian Adam Siegel gave a rousing speech for the crowd that had gathered, followed by statements from our colleagues from UPTE and the UC-AFT Lecturers Unit. 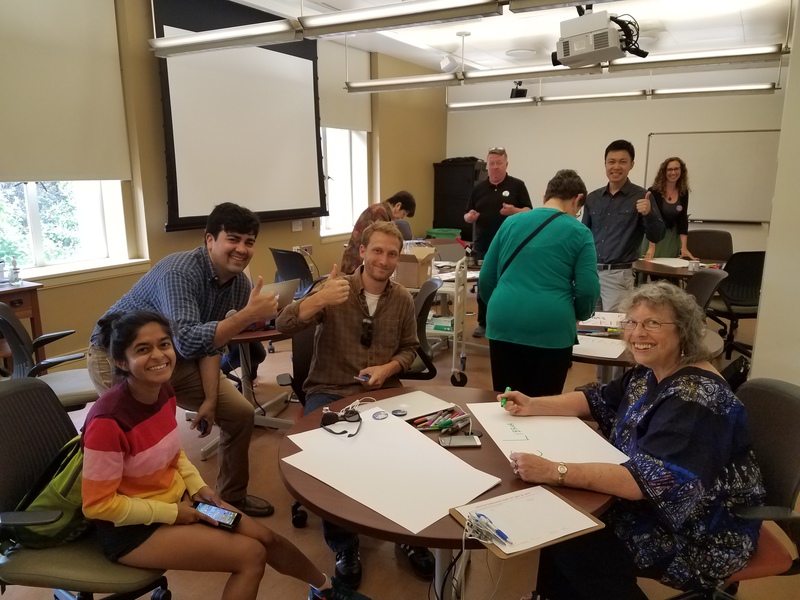 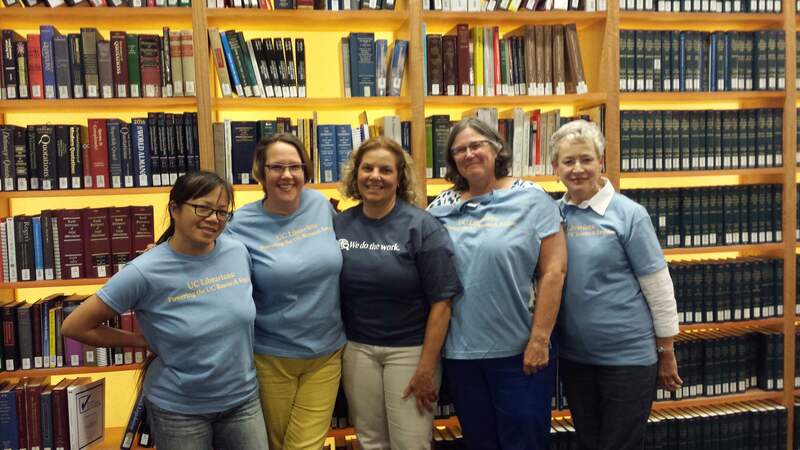 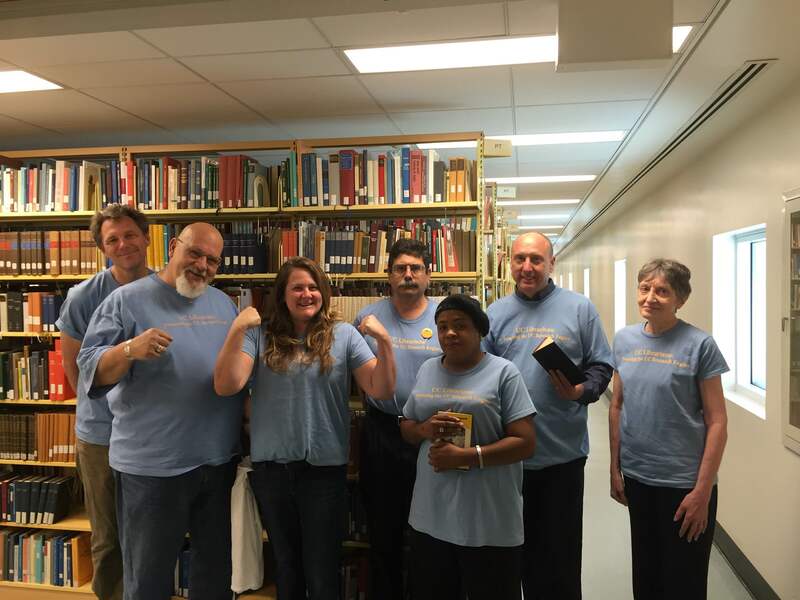 The table team was energized and grateful for this dedicated show of support! 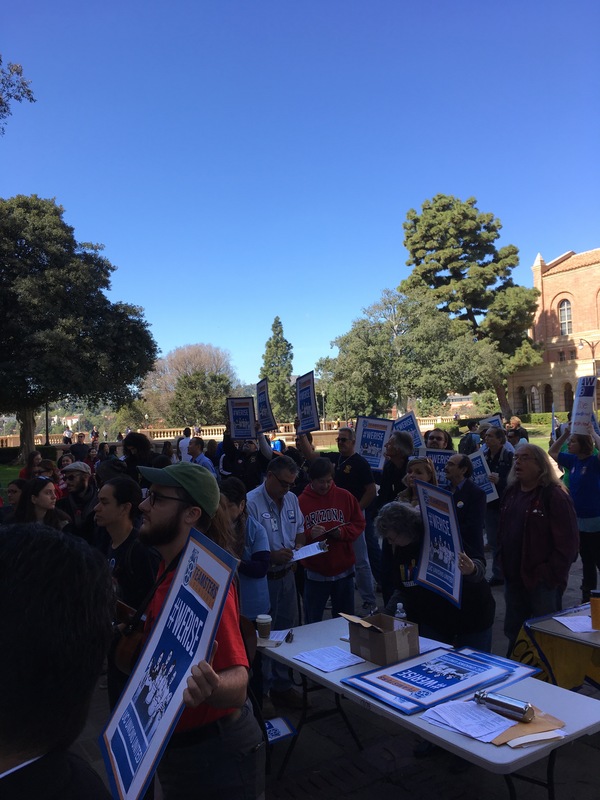 After lunch, both sides returned to the bargaining table. 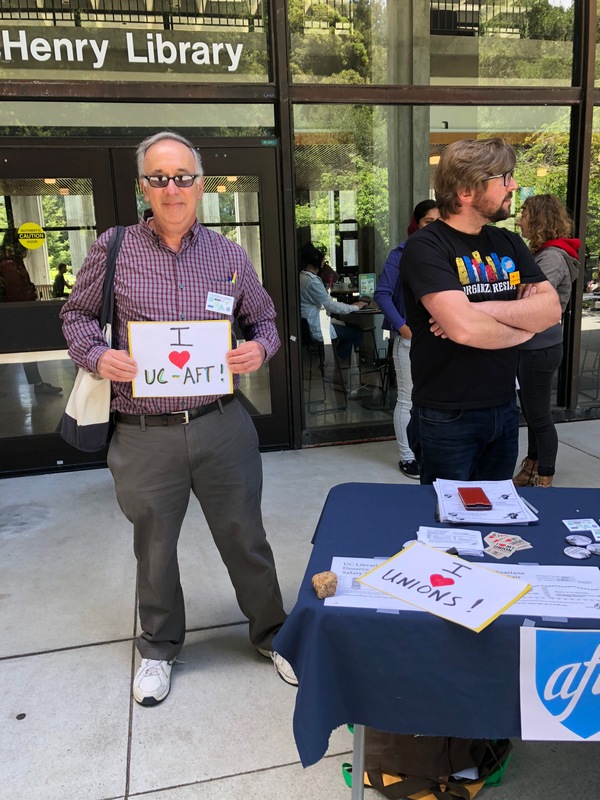 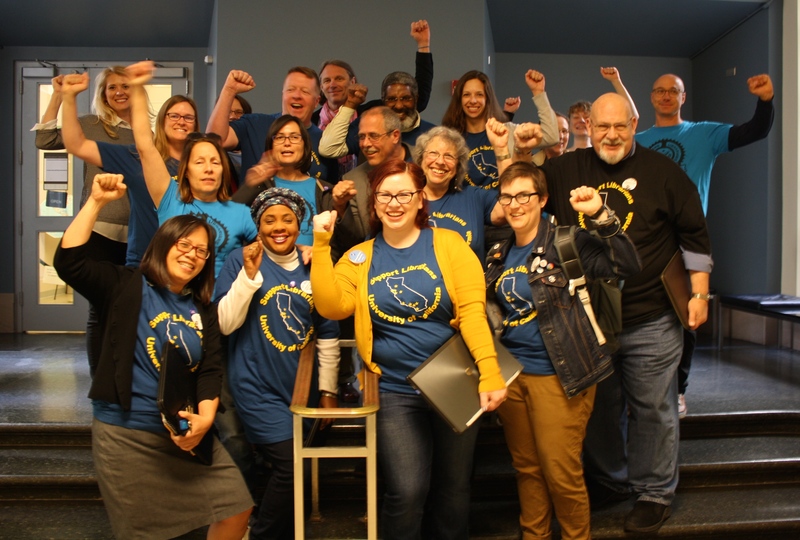 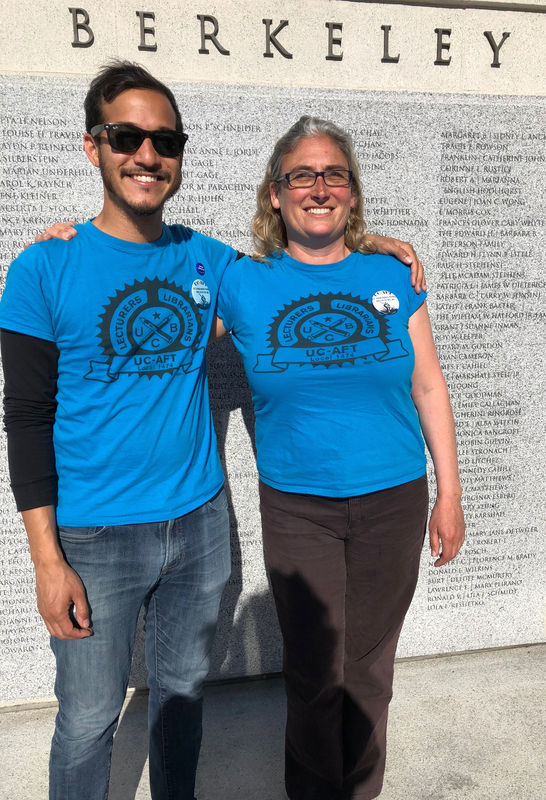 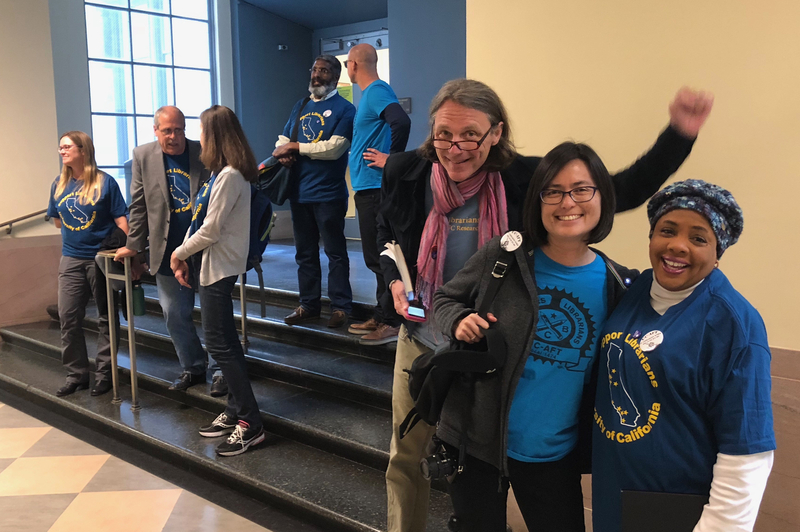 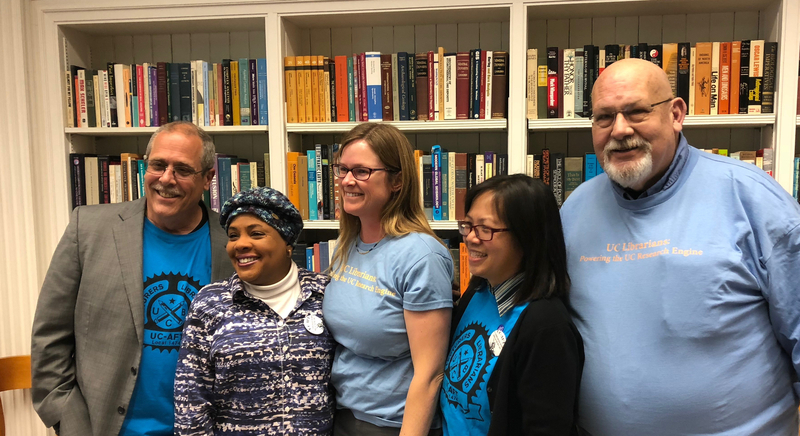 UCOP negotiator Tony DiGrazia spoke for some time about moving forward in the bargaining process, citing our experience in coming to a tentative agreement for Article 24 (Grievances) and their desire to work on open articles in a similar fashion. 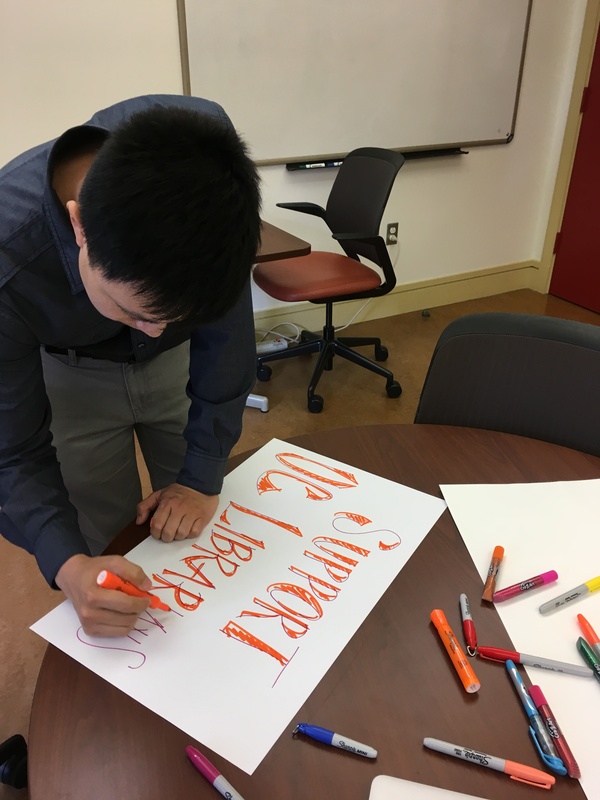 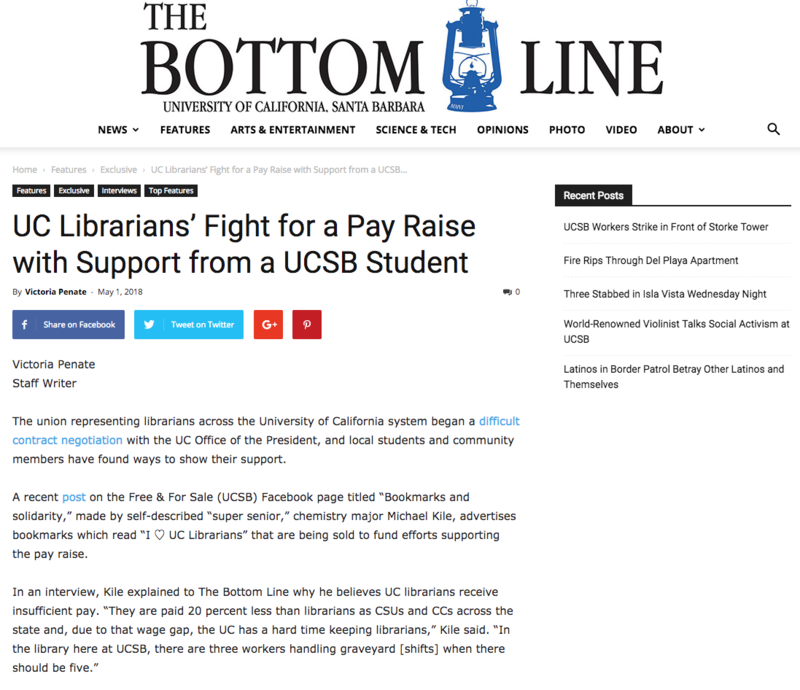 The Table Team expressed our concern that UCOP’s response to many of our articles has been CCL, and that we were interested in having more meaningful discussions about our proposals, to surface what UCOP sees as wrong with our proposed language. 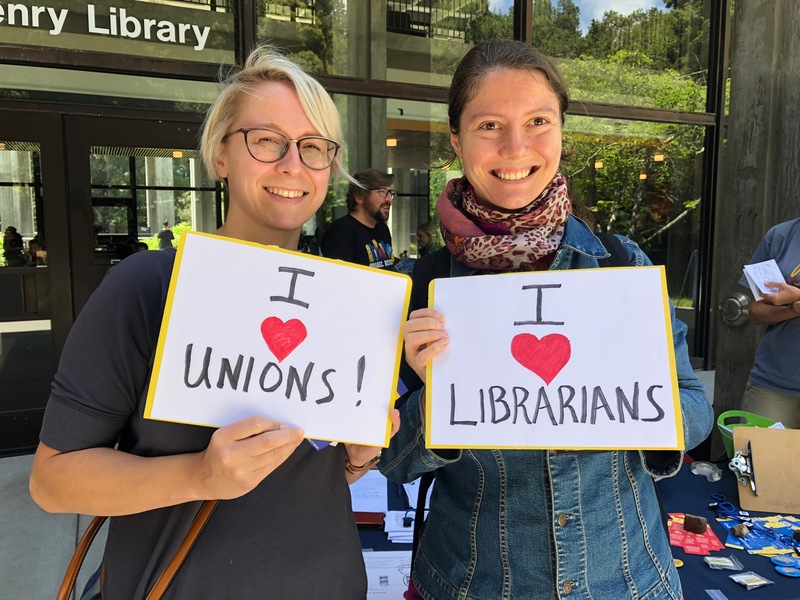 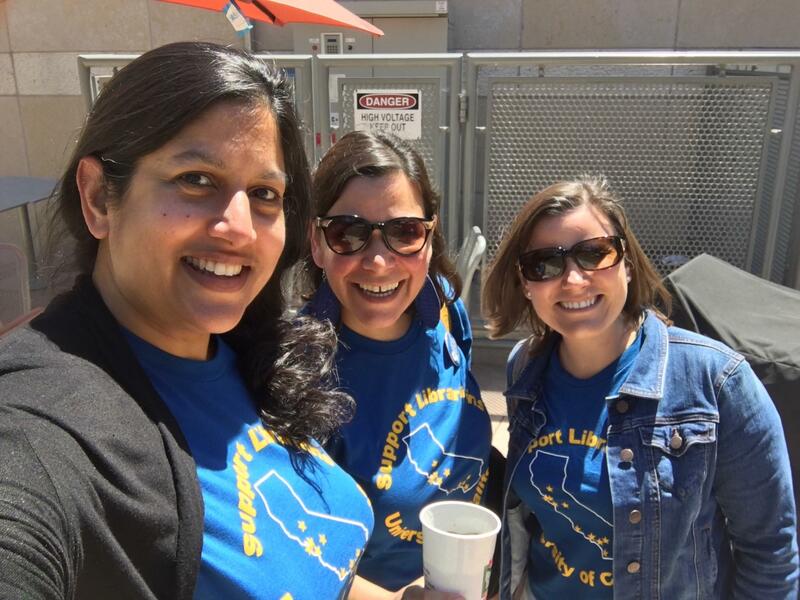 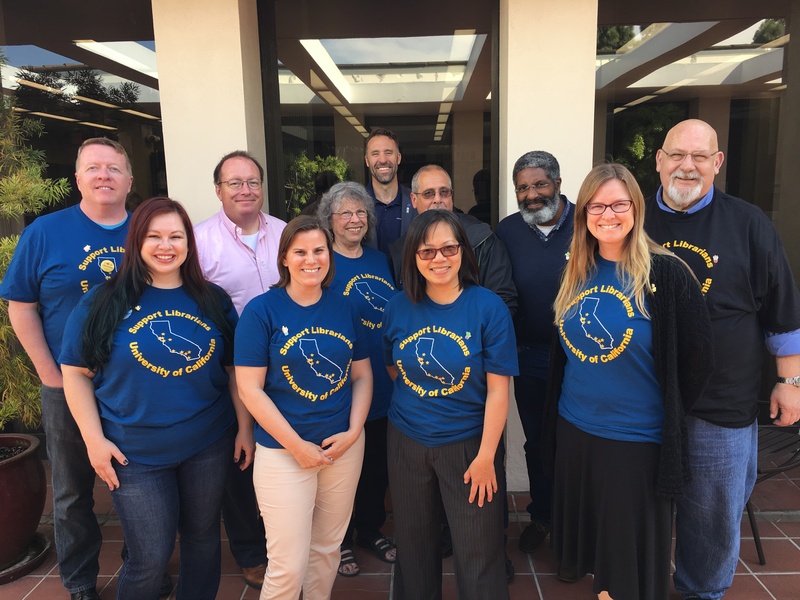 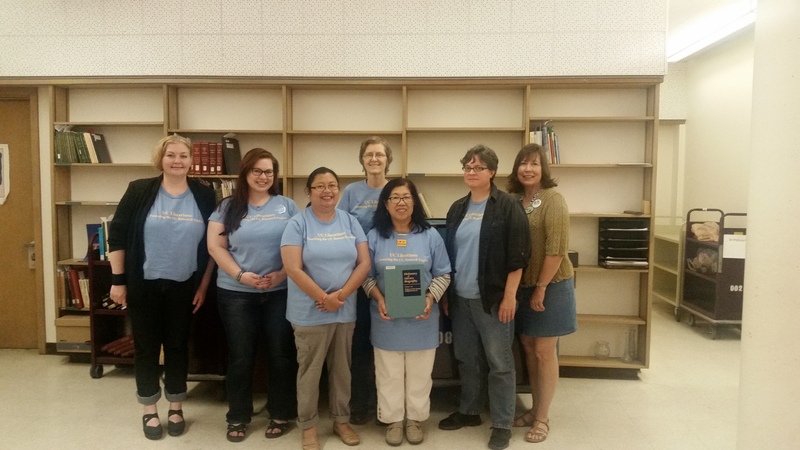 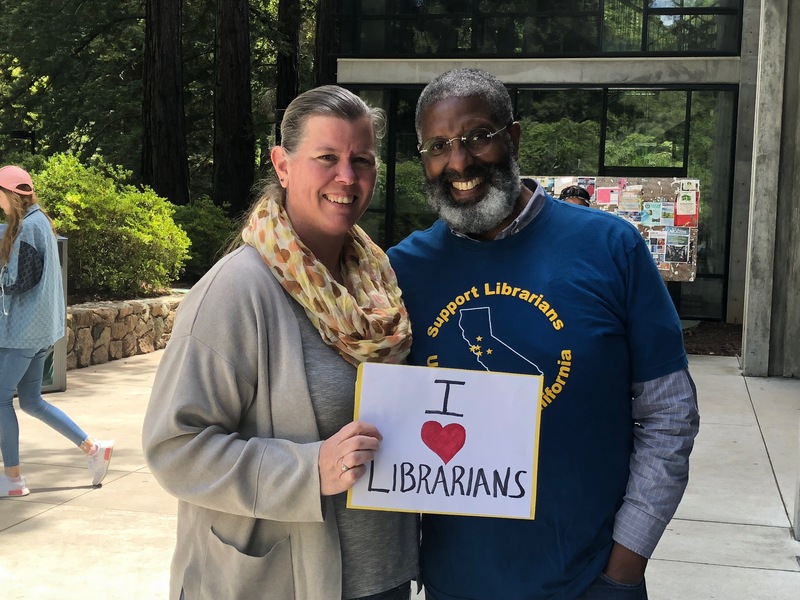 Our union members know that we have made proposals for non-economic articles (i.e., not salary or professional development funding) at your request, because of problems and issues that have arisen out of the CCL. 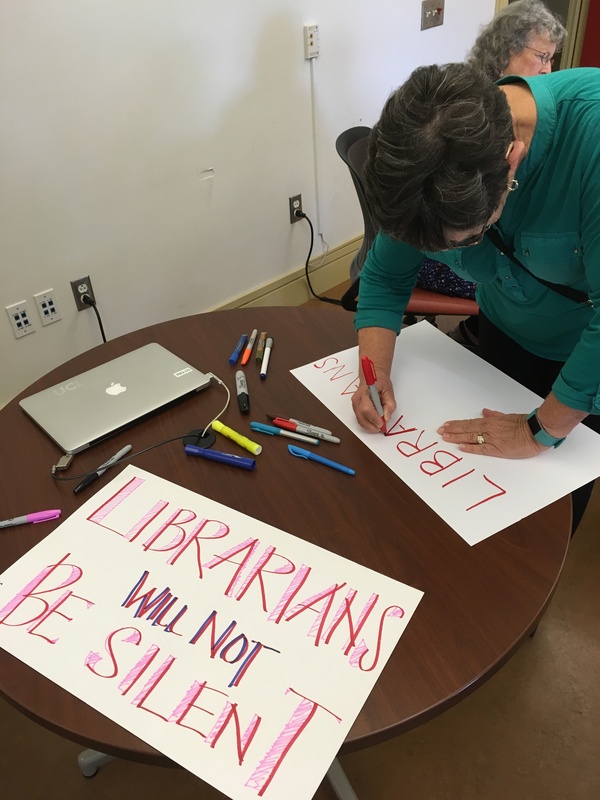 We want to fix these problems through contract language that is clear and transparent, and fair to librarians. 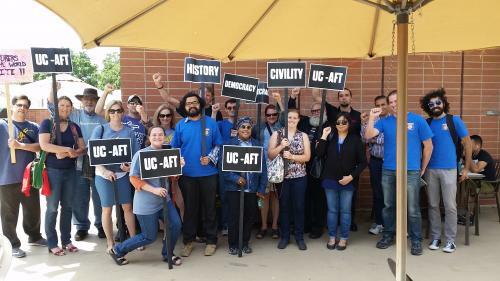 We will continue to negotiate in good faith with UCOP for a fair contract. 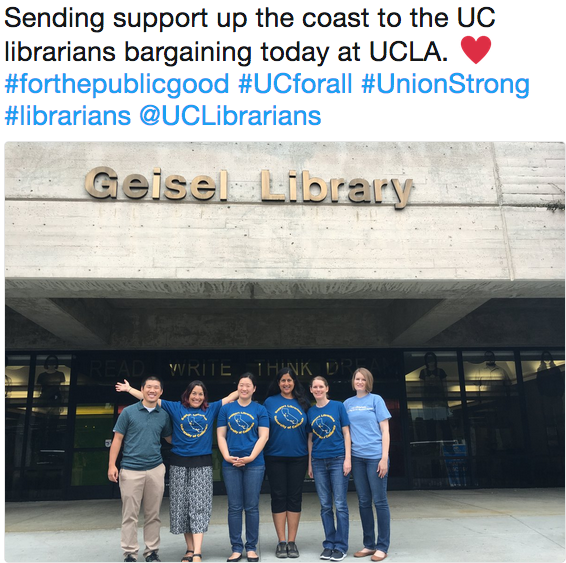 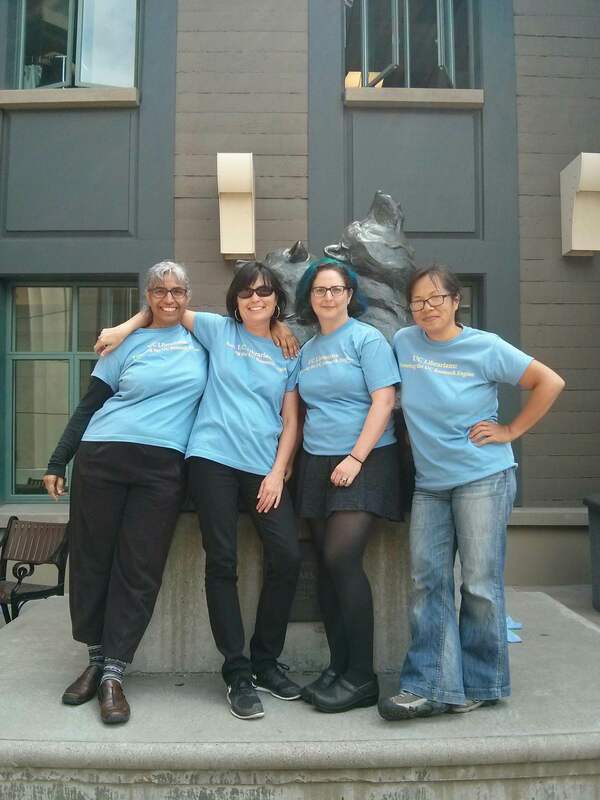 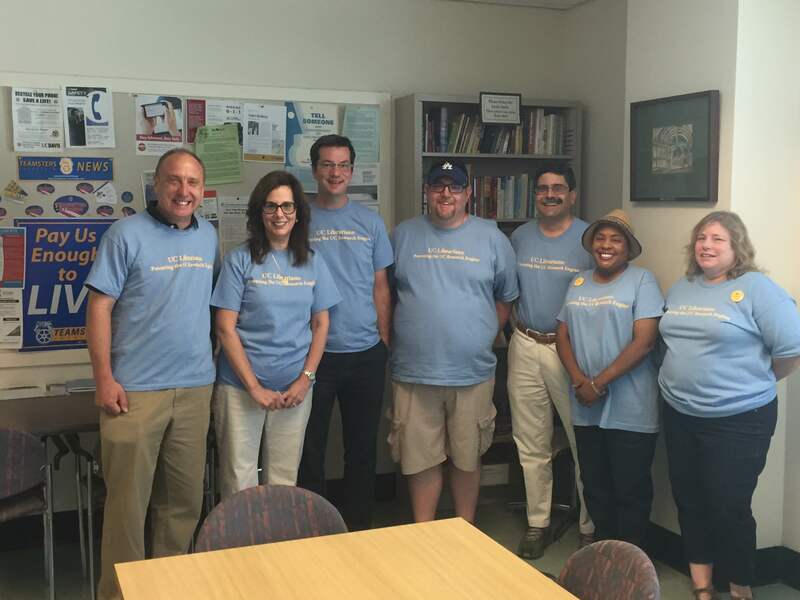 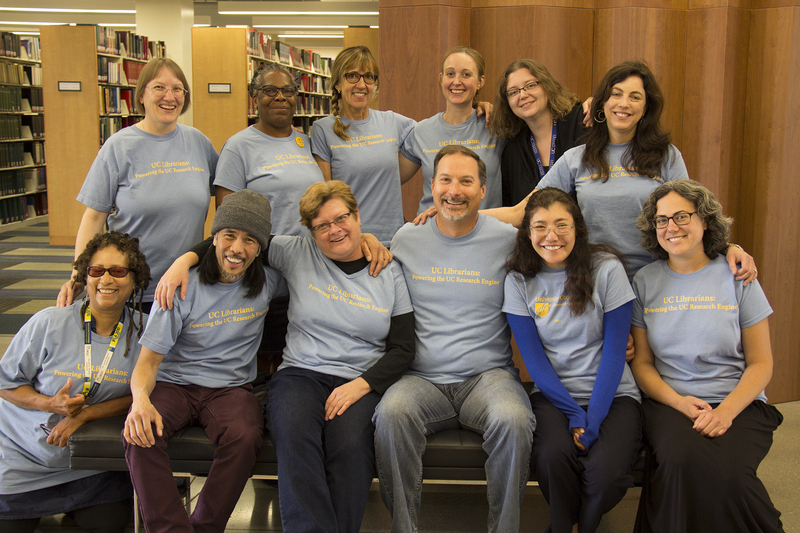 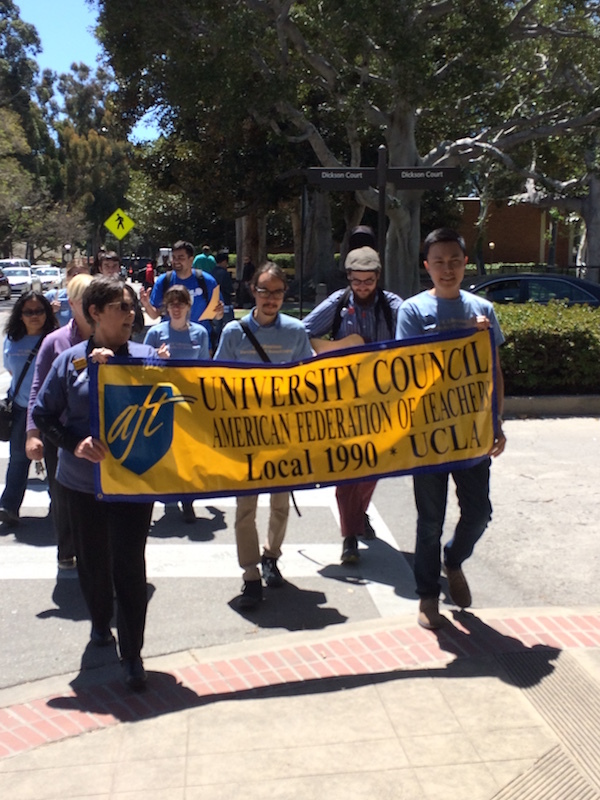 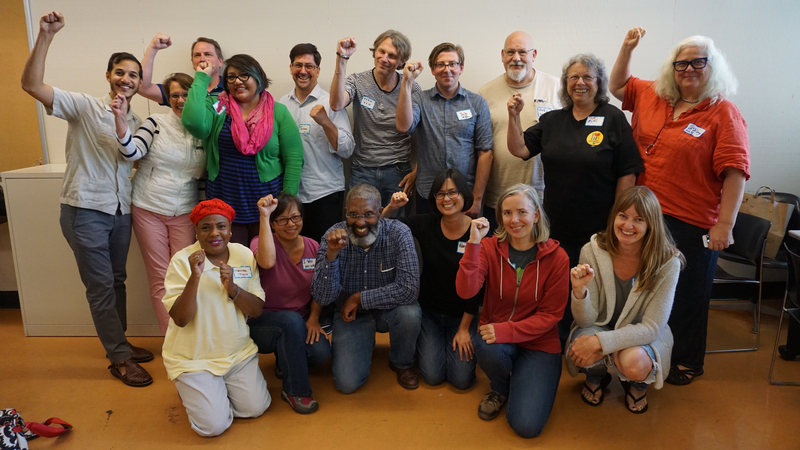 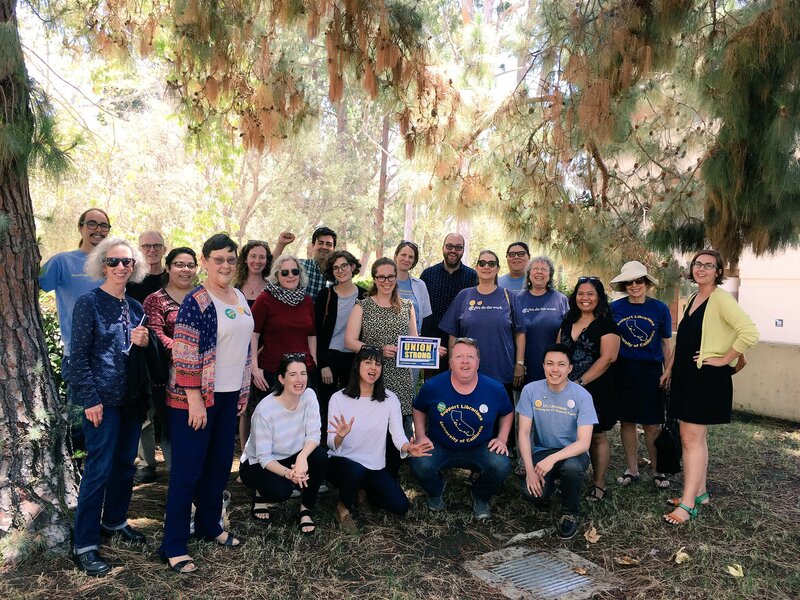 Our next bargaining session will be on February 1st at UCLA.